I have a phot copy of this very letterhead that I recieved when I went to the library of Congress in Washington as a boy. The curator brought out several pieces and offered to copy them for me as a soviener. Mine has Houdinis signature on it. I wish I could have gotten the original. Cool. Thanks, Chuck. So we know this is the real deal then. I've seen this one too. The one that impressed me was the circus one that sold a few weeks ago. Although it was close to being a remnant, it was very interesting. Circus stationary? Did I miss that? 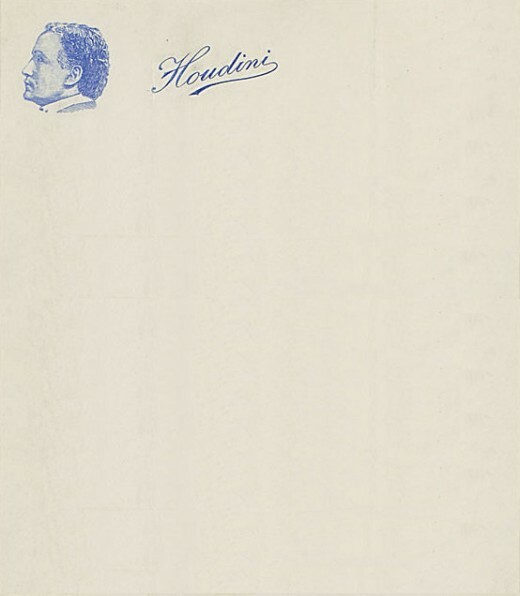 The letterhead is on Page 55 of the catalog for the Great Houdini Auction-Radner Collection, 2004. Ah, cool, there it is. You're amazing, Eric! Can't see that it's blue in this shot, however. Looks like it was smaller, personal stationary as opposed to letter size. That's a great letter, btw. Looking back through this catalog... I wonder who got those two spears from Terror Island? I would have done everything I could to get those. I still kick myself for not attending this auction. But my head just wasn't in the Houdini game at the time. I have an original piece of this stationery. Oh, by the way mine has a letter and signature! BTW: 1912 is correct—the one I have HH notes, "April 6, 1912 (My birthday 38th today)"